It's a Scrappy World: 2-21 Stella Says Sketch! Cute card! Thanks for joining us at Creative Craft Cottage! Very cute card! Love that image! Thanks for stopping by Jo's Scrap Shack and linking up in our Funday Friday challenge this week! Have a great day! What a beautiful and fun card! Great coloring! I love bugaboo digi stamps, they are so cute! Hehe, such a cute card! The image is so adorable! What a fun card! Your little pig is just adorable! Great design! Love his flowered shirt!! Thanks for joining us this week for the QKR Stampede weekly challenge! So cute and fun. Love this pig and your coloring. Thank you for joining us for the QKR Stampede Pile It On Challenge this week. Great card! Thanks for joining us at PDE Linky Party. Very cute card, great image. Thank you for joining us at 2 Creative Chicks. Such a fantastic card! And a great use of your scraps. The image is just too cute. Thanks for joining Fun~day Friday at Jo's Scrap Shack. Adorable!! Thanks for joining us at 2 Creative Chicks. This is such a cute card. I'd like to tell you about some challenges I'm a part of where you can enter this. It would be such a blessing to have you play along in our FUN challenges. I really hope you will join us! Hope to see you at ALL these fun challenges. I'd sure be happy to see you there! 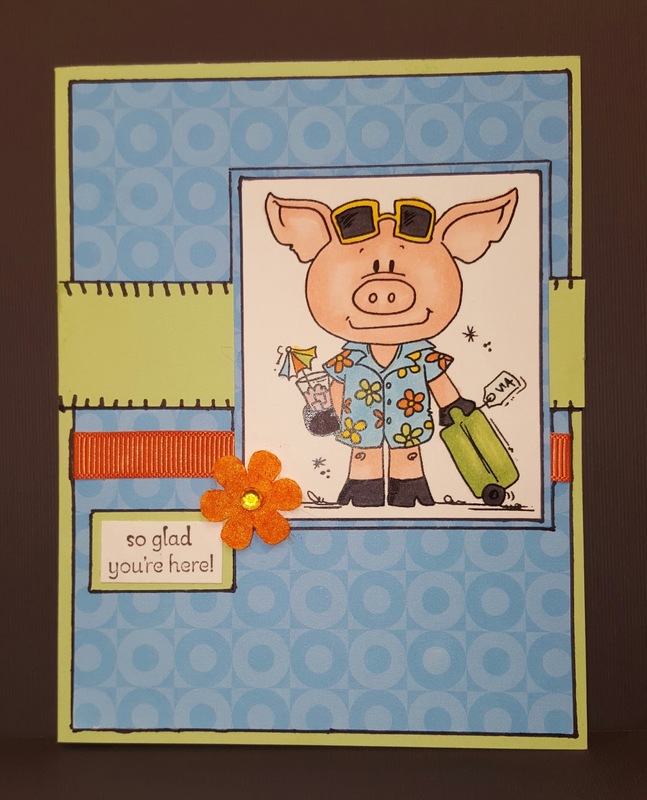 This is such a fun card, and that whimsical pig makes me grin from ear to ear. The orange ribbon pops off the page! Nice work! Thanks so much for joining the fun at Really Reasonable Ribbon's "Celebration" challenge! A really cute card, love the image. Thanks for joining in with the Sisters of Craft challenge, best wishes, Anne (DT). Hiya, I'm back again..still loving this little chap. Great card - a really cute little guy! A great card - love that digi!